The Anglican Church of Korea is a small, but dynamic, church of around 55,000 members spread over three dioceses: Seoul, Daejeon and Busan (because of official transliteration changes the second two dioceses used to be known as Taejŏn and Pusan respectively). Together these cover the whole of South Korea. The church was started by missionaries from the Church of England in the late 19th century and has had a strong focus on social outreach and on enculturation of Anglican Christianity within the cultural traditions of Korean society. The Anglican Board of Mission's (ABM) relationship with the church dates back to the early 1960s when the Rev'd David Cobbett, an ABM missionary, worked in Seoul and Busan. His time of service there is warmly remembered and the links between the now Diocese of Busan and Rev'd Cobbett, who died earlier this week in Adelaide, remained warm and valued till the end. Rev'd David Cobbett was ordained to the priesthood in the Diocese of Newcastle in 1953 and travelled to Seoul in 1957 with his wife Alison to attend the Inter-Missionary Language School for two years, becoming the first Australian missionary to South Korea after the Korean War. He was an inspirational figure in the Australian Church and an outstanding symbol of ABM mission activity, who had also served on regional committees, the Board and Standing Committee of ABM. Of his time in South Korea, Rev'd David wrote: ‘The South Korea and the capital Seoul that I knew in 1957 were very different from modern day South Korea and Seoul. The ancient kingdom had been broken in pieces by the 1950s Korean War and at the war’s end, the country was divided in two. Bishop John Daly appealed for priests to help the tiny Anglican remnant that fled south. After intense language study, I was asked by the Bishop to move south to a small congregation of refugees in a one time Japanese Church in Pusan City. I was driven there by the diocesan Land Rover through sporadic gunfire as citizen groups overthrew the dictatorship of Syngman Rhee. That was my first novelty: going through gunfire to one’s first parish as a missionary priest. ‘The needs were vast so the work in Pusan City expanded quickly with the devoted help of Korean lay workers and clergy and ABM’s support was always there. Soon the existing red brick church, hall and house were too small. So we extended and at the same time began schemes to help students afford school expenses and have safe places for out of school study. We began to help refugee widows to find employment by starting a parish sewing school and giving every graduate her own sewing machine. Soon it was wise to move from the inner city church to an outer suburb and create another parish. ‘With the financial help of friends and family in the Diocese of Newcastle and with local advice we bought a house and land and pioneered new work. This parish and the now Pusan Diocese sold the land and buildings for a good profit and bought another property nearby. They invited Alison and me back for the opening and dedication. We declined the invitation but sent our loving wishes. ‘Every Monday afternoon in retirement I am on duty as a volunteer for three hours in St Peter’s Cathedral, Adelaide, to help people with counselling. This march I met two Koreans who came to the Adelaide Festival. They were stunned to find a Korean speaker and before they left they said two things, “People have a high regard for the Anglican University in Seoul and for the leading role played by the Church in work for human justice”. ‘Those of our little band of eight English, twelve Korean and one Australian priests working there after the 1950s war would smile at that report from March 2010! Give thanks for Rev'd David’s pioneering work in Korea, and give thanks for the work and witness of the Diocese of Busan (성공회 부산 교구, the Seonggonghoe Busan Gyogu) today, remembering especially the Rt Rev'd Onesimus Dong-shin Park who is the bishop of the diocese. 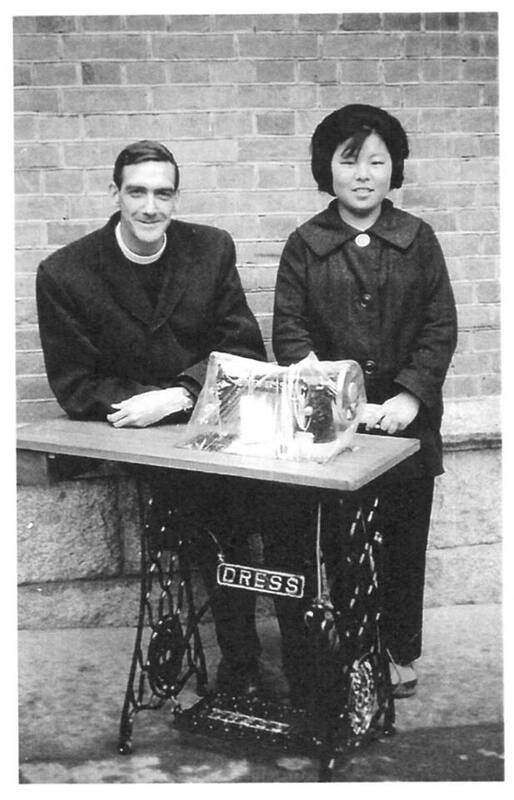 Rev'd David Cobbett presents a sewing machine to a graduate of the Pusan parish sewing school.